Heat the oil in a large skillet over medium heat. Add the onions, season generously with Kosher salt and cook, stirring occasionally for 3-4 minutes. Add garlic and cook for 1 minute, stirring to avoid burning. Reduce the heat to low and add rice. Cook for 2-3 minutes, stirring constantly. Add broth, the zest and juice of 1 lime, and a pinch of salt. Raise heat to medium-high and bring mixture to a boil. Reduce heat to maintain a gentle simmer, cover, and cook until the rice is done as per the directions on your bag of rice (my brown rice took 40 minutes to cook, but different brands and types of rice have different cooking times). 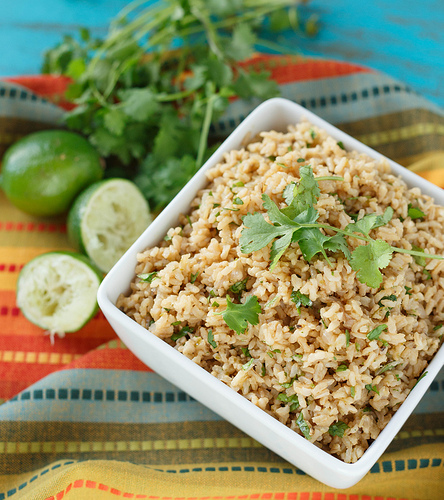 Once liquid is completely evaporated and rice is cooked, fluff rice with a fork and stir in cilantro. Taste and add the juice of the second lime if needed. Mine did not need the second lime because the first one was really juicy.